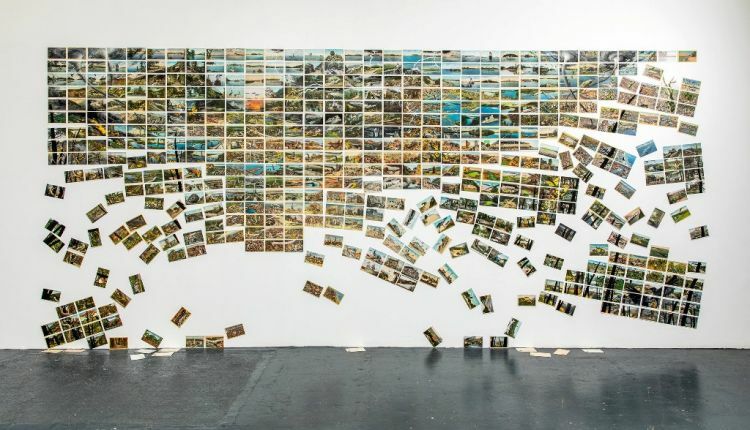 With “This Land,” David Opdyke melds art and activism, hoping to inspire urgent changes in vision, one postcard, and viewer, at a time. Seen from the far side of David Opdyke’s street-level studio in Ridgewood, Queens, his dire new art work, “This Land” (over 16 feet wide and 8 feet tall), looks like some sort of mosaic. A grid-work array of colorful tiles (parts of which appear to be falling away toward the bottom), portrays a panoramic bird’s-eye view down both sides of a V-shaped valley, the sun rising in the pristine distance. A crisp, lush pastoral expanse. A bit closer up, and the individual tiles reveal themselves to be vintage postcards from the first third of the 20th century — black and white photographs overlain with stylized tinted colors, each one (and there are over 500) portraying a distinct slice of idealized Americana. Town squares, mountain highways, recently completed dams, main streets and county seats, lakes and rivers, forests and farmsteads: intimations of a prodigiously gifted country positively breasting its way into a confident future. Closer up still, though — and you may need to lean in really close to begin making them out — it becomes clear that Mr. Opdyke has layered in a whole series of diminutively painted interventions of his own, and these limn an altogether darker sense of things as they might be several decades on for this land we appear hellbent on leaving to our own children and grandchildren. For indeed, up close we can see that in Mr. Opdyke’s fevered vision, the forests are aflame, smoke billowing up from one card into the next, while an orange grove is decimated by freeze. (“Some say the world will end in fire, some say in ice.”) A steamboat lolling up the Mississippi is being swallowed up whole by some sort of invasive new species: a mega-faunapus, if you will. The shimmering wheat fields are desiccated, the once proud threshing machines abandoned. A plague of locusts swells out over another tranche of cards. Giant tornadoes churn through entire sections of the grid up to the left. Frogs are falling out of the sky to the right. Monarch butterflies flit and flutter, probably the last of their kind. And then there’s evidence, too, of the human response: a cacophony of cults and cons, panic and denial. Biplanes trail banners urging, “Repent Now!” One insists “Legislative Action Would Be Premature,” while still others veritably beg, “Build the Sea Wall!” All over the place blimps float through the sky, offering seats on The Ark — and indeed, over there to the right, across several cards, an Ark is busily being slapped together. Alcatraz Island has been given over to high-rises, with sale banners advertising “Flood-Proof! Secure Luxury!” — which is to say, a whole different kind of prison. Mountain playgrounds promote “Artificial Snow!” Traffic jams coil endlessly off into the distance, a green highway sign advising, “Someplace Safe: 96 miles.” Stadiums have been converted into water reservoirs. And pipes course every which way, binding the entire piece in a web of compounding cross-purposes (fracked oil, water diverted toward the privileged and away from everyone else). Every structure, even the cliffscapes, seems slathered with livid graffiti, and from the lower right rises up a sinister murder of crows. After such knowledge, what forgiveness? “This Land” invites and rewards and presently compels close viewing: You get sucked in, and as minutes pass, ever slyer details emerge. Eventually you pull away, and the wider scene reverts to that bird’s eye pastoral sublime. Only now you realize the sun hovering above the distant horizon isn’t slowly rising: it’s fast setting. It’s not as though the Queens-based artist just up and started thinking along such apocalyptic lines. He’s been pondering them good and hard, for a long time. Back in 2006, for example, he perpetrated “Prospect,” the bas-relief to end all bas-reliefs, an idyllic sylvan scene (a meadow, a copse of trees) idling atop a wedding cake cross-section of the geological underground, each layer distinct and differentiated, with a thin seam of compressed plastic and metal refuse coursing down below. “The stuff’s positively indestructible,” he noted at the time, “and may well end up being all that’s left to mark our time on this earth.” Tomorrow’s Day Before Yesterday, as it were: a regular laugh riot. That, at any rate, is the decisive wager for Mr. Opdyke and artists like him. “This Land” will be receiving its vernissage later this month as part of a mini-retrospective, “David Opdyke: Paved With Good Intentions,” opening Jan. 25 (through Feb. 27) at the University of Michigan’s Institute for the Humanities in Ann Arbor, where Mr. Opdyke will be in residence as this year’s Efroymson emerging artist. After that, one could easily imagine the piece’s touring the country, dallying in the very sorts of storefronts depicted in its cards, or else in museum or city hall lobbies all around this land, a global warming equivalent of the touring version of the Vietnam Veterans Memorial. Its grid of card tiles would likely need to be lodged behind some sort of protective glass, its throng of viewers reflected, as with the Vietnam memorial, simultaneously in front and behind the scene before them, and thereby directly implicated in the piece’s unsettling unfolding pageant.